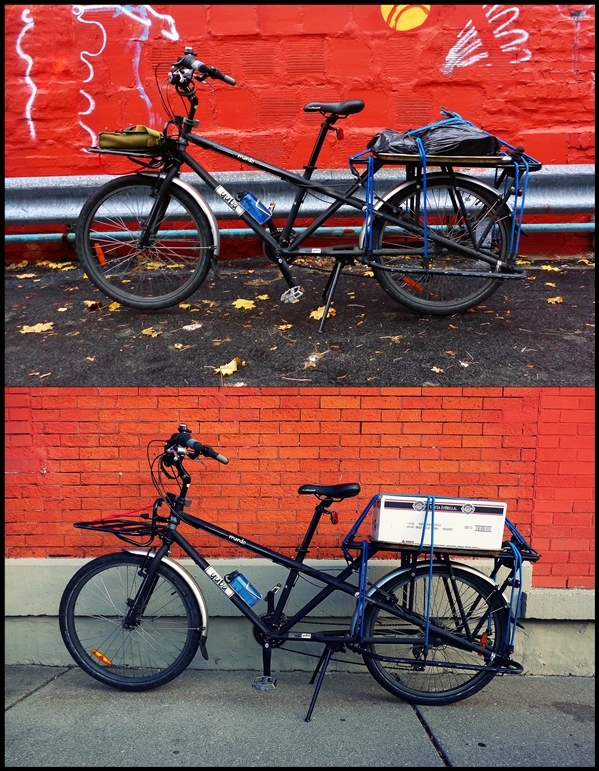 #416 (first photo above)...a canvas bag containing a few books; a double plastic bag containing a cooked turkey carcass, and a few vegetables for mirepoix. 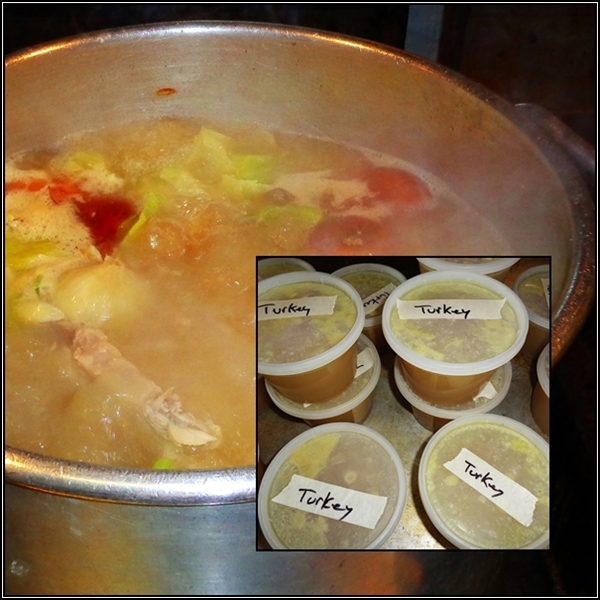 #417 (second photo above)...a cardboard box containing 18 pint contains full of still-warm turkey broth. Okay, so here's the deal. Nearly every year, after our Thanksgiving feast at one of my sister's houses, I take the turkey carcass(es) and make turkey broth with it/them the next day. I usually have off of work and it's a great day just to take it easy around the house and let the broth simmer. Then, after straining and packaging it, I freeze it and have homemade broth for weeks/months ahead. Well this year I had to work...but I still took the turkey carcass (I'm a professional cook, I can't let something that good simply be discarded). Anyhow, I carried the carcass to work, made the broth there (one of the many privileges of working in a kitchen), packaged it, and carried it home. It now resides in my small freezer for future use. The recipe for turkey broth (which is super easy to make and really delicious) is below. For additional recipes that highlight ways in which to utilize Thanksgiving leftovers, click here or here. Combine the ingredients in a heavy-bottomed stockpot and cover with enough cold water to cover them by two inches. Bring to a boil, then lower the heat to a slow simmer. Cook for a few hours, skimming the surface as necessary. Strain and refrigerate until needed.